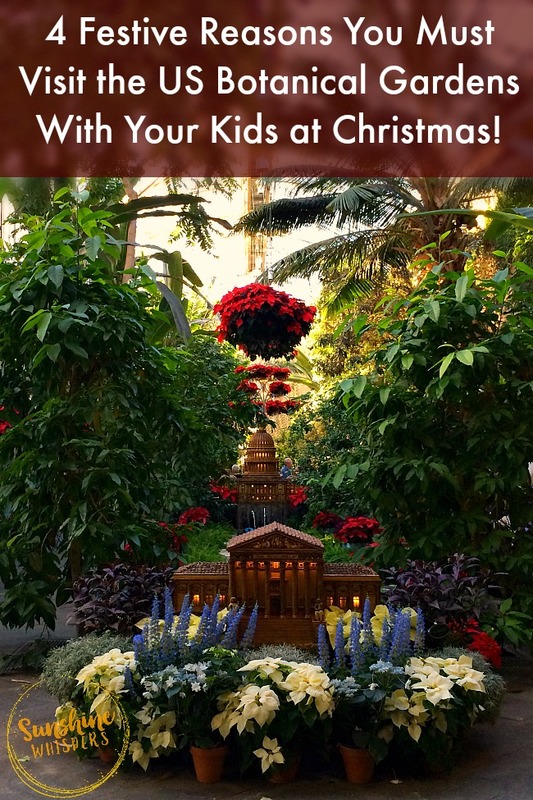 4 Festive Reasons You Must Visit the US Botanic Garden With Kids at Christmas! 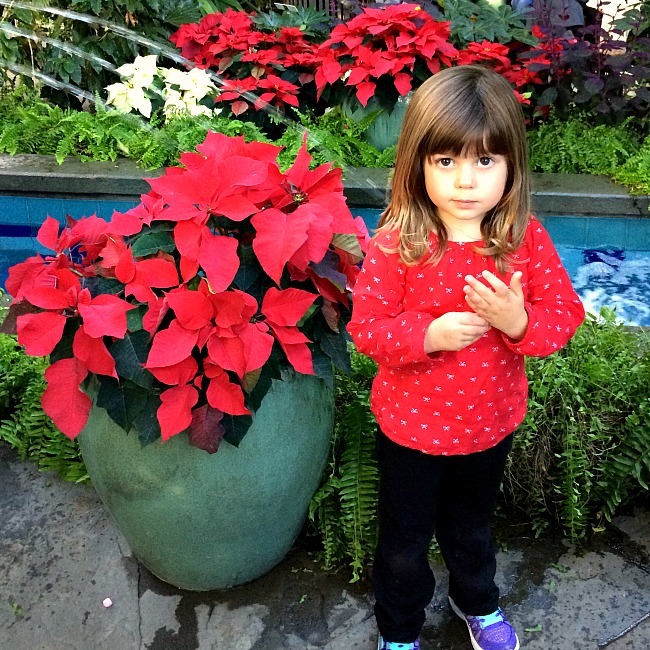 Inside: The US Botanic Garden in DC is the perfect place to take kids at Christmas. It was an unseasonably warm day for Washington D.C., which made it the perfect day to play hooky from work and explore the city with my daughter. The White House Christmas Tree had been lit the week before, and when I saw the forecast called for sun and temperatures in the mid-sixties, it felt like a match made in heaven. 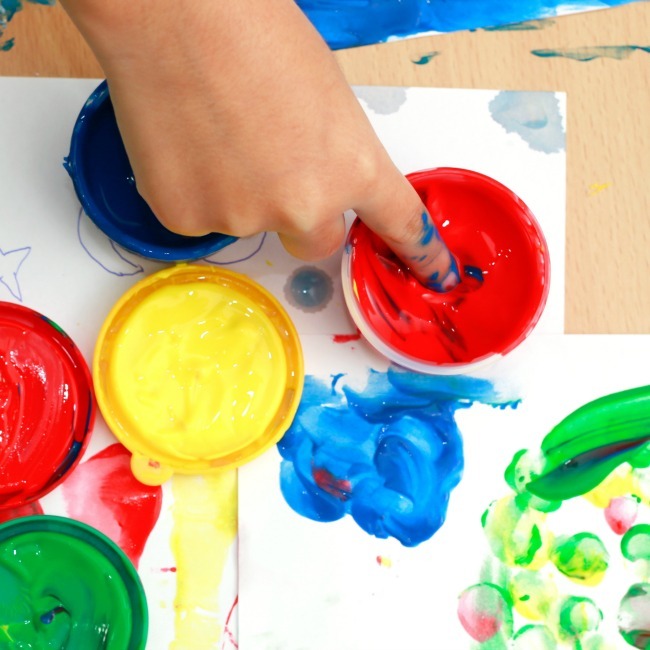 There are many holiday festivities in DC designed to delight the eyes and ears of little kids. 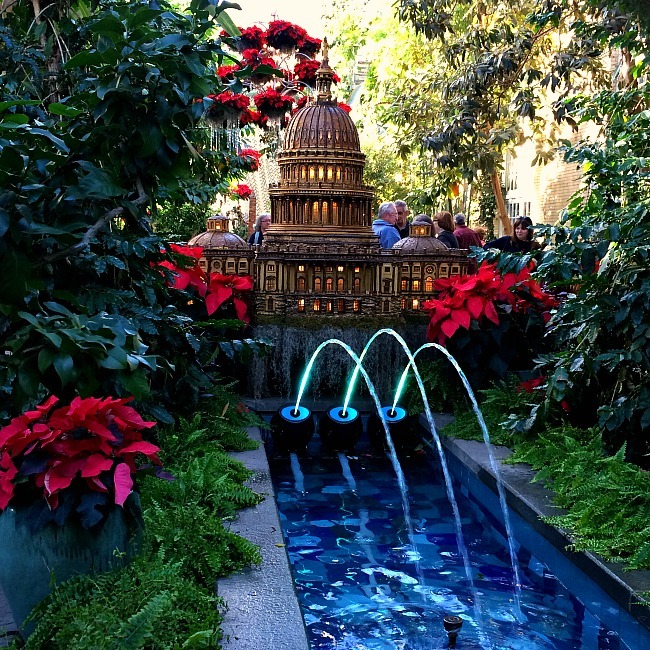 I had heard that the holiday display at the U.S. Botanical Gardens was not to be missed. So, after visiting the practically empty Smithsonian Museum of Natural History, we hitched a ride (to preserve tired little legs and tired little moods) to check it out. As we entered the main room of the gardens, our senses were tickled with delight. 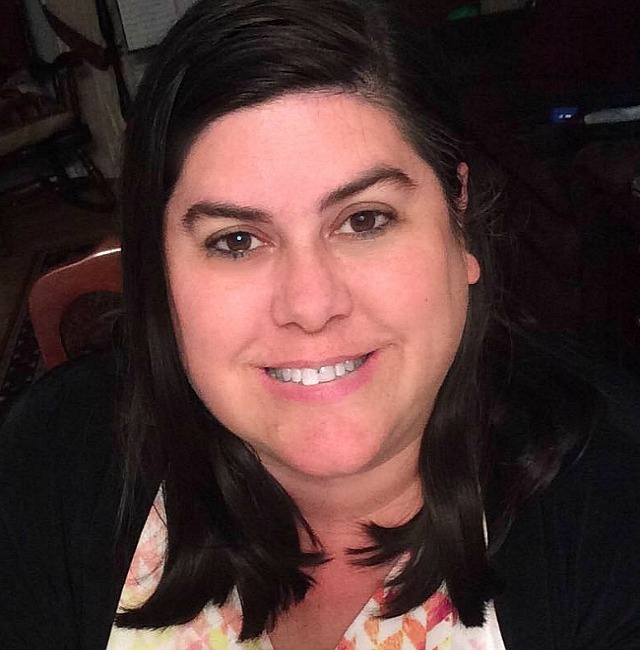 Even though the outside weather was mild, the inside temperatures were balmy. The main room of the botanical garden gurgled with the sound of fountains and every corner was filled with lush greenery and bright red poinsettias. And that was just our first impression. 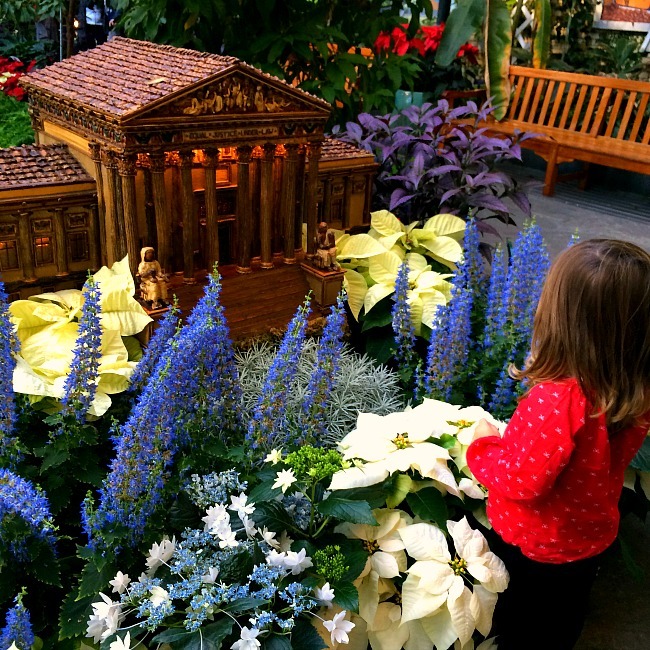 There are a few delightfully festive reasons you must add a visit to the U.S. Botanic Garden to your Christmas family fun list! The U.S. Botanical Garden’s most lavish display are the organic sculptures of all the main buildings and monuments in Washington D.C. They are amazingly detailed and absolutely beautiful… and then you realize that they are made entirely of organic (plant) materials. That fact alone will cause your jaw to hit the floor at least once as you stroll through the main room of the gardens and marvel at how intricate these sculptures are. It also doesn’t hurt that there are bright red poinsettias everywhere. They are hanging from the ceiling, lining the floor. They are everywhere and it makes the entire experience very festive. There’s a playful fountain installation with the U.S. Capitol at one end and the Supreme Court at the other. 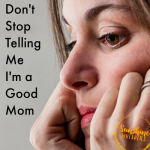 If you can manage it, I would highly recommend timing your visit to avoid the weekends. Why? Because as beautiful as the main room is, a very big kid-friendly highlight will be the holiday train display– and it will be very popular. 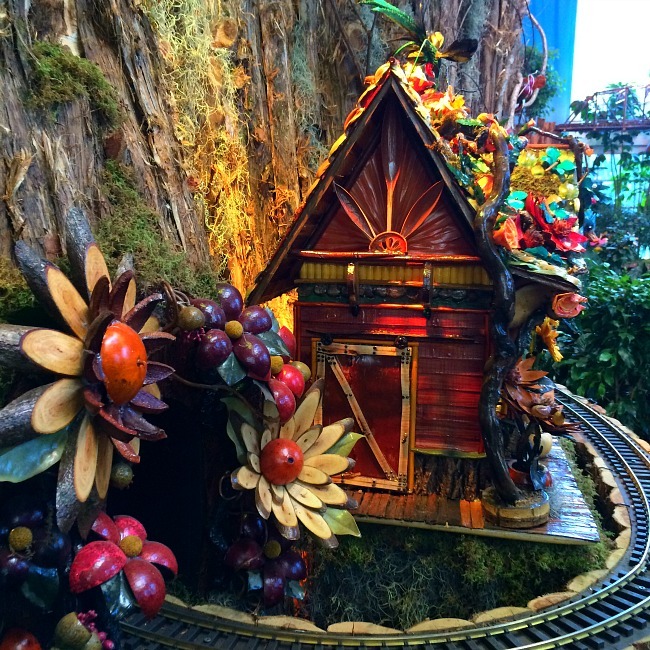 In 2015, the theme of the train display was Pollination Station. The Pollination Station theme continues in 2016, but with a very special twist. Since 2016 marks the 100th anniversary of the National Park Service, the trains will journey through plant-based recreations of many of the iconic national parks and historic places. According to the website some of these landmarks will include the Gateway Arch, the Grand Canyon, and the Statue of Liberty. Again, everything about this train display, except the trains and train tracks, will be plant based. How cool is that? 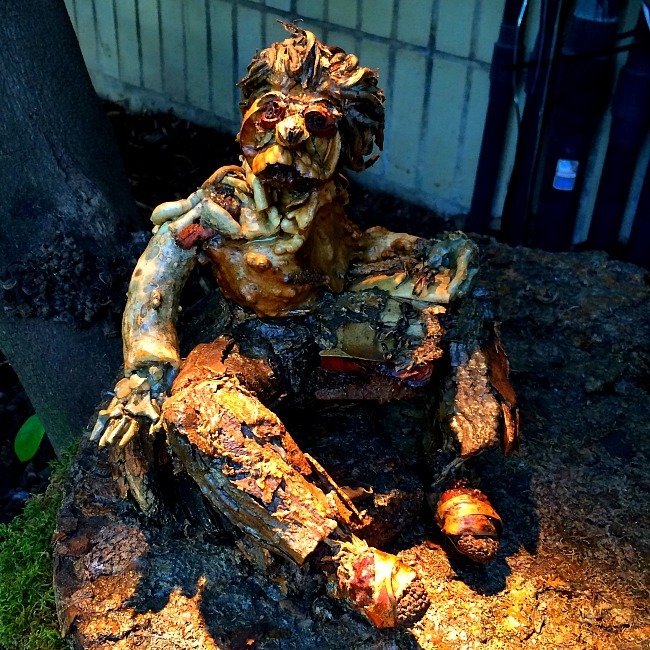 Take photos as inspiration for your springtime fairy house making! 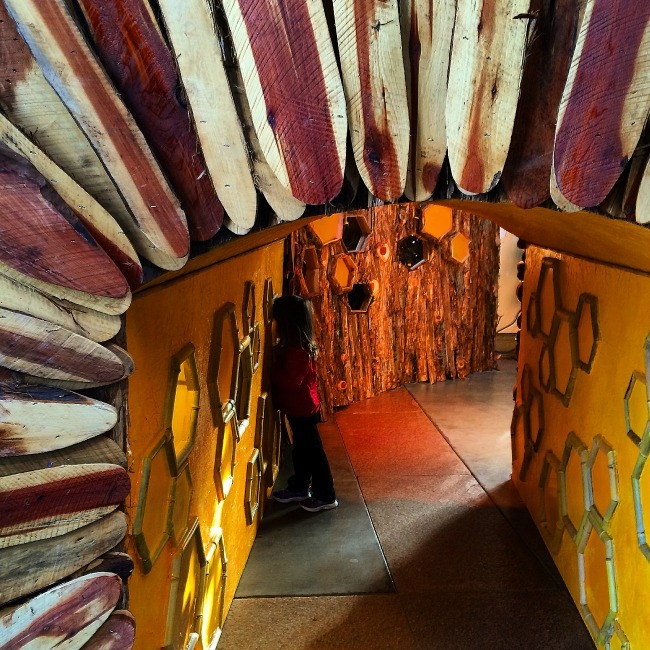 Sweet Pea loved checking out the small worlds that were recreated inside the big bee hive. Since you are already at the gardens, why not check out the rest of the US Botanic Garden exhibits? Sweet Pea loved running through the tropical rain forest. 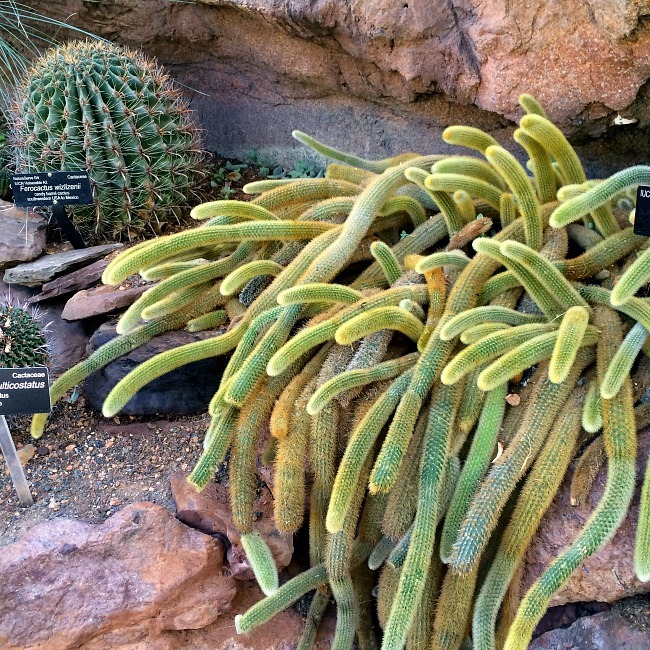 The variety of desert cacti also prompted a few discussion points. To round out our absolutely delightful visit, we ended with a stop to see the gigantic Christmas Tree, which is housed in an room adjacent to the main hall, at the opposite end from the train display. This Christmas Tree is enormous and quite literally decked to the halls (is that even a phrase?). 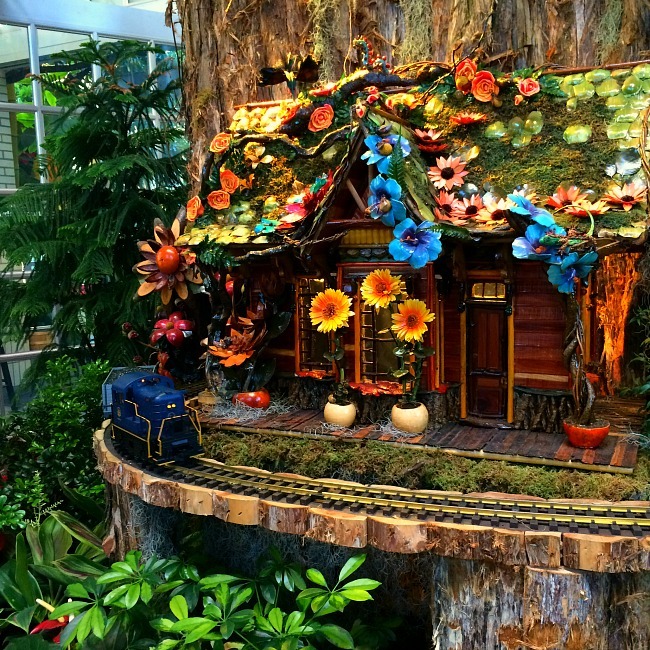 There is another train that runs around the base of this tree, and your kids will love trying to spy Thomas the Train! 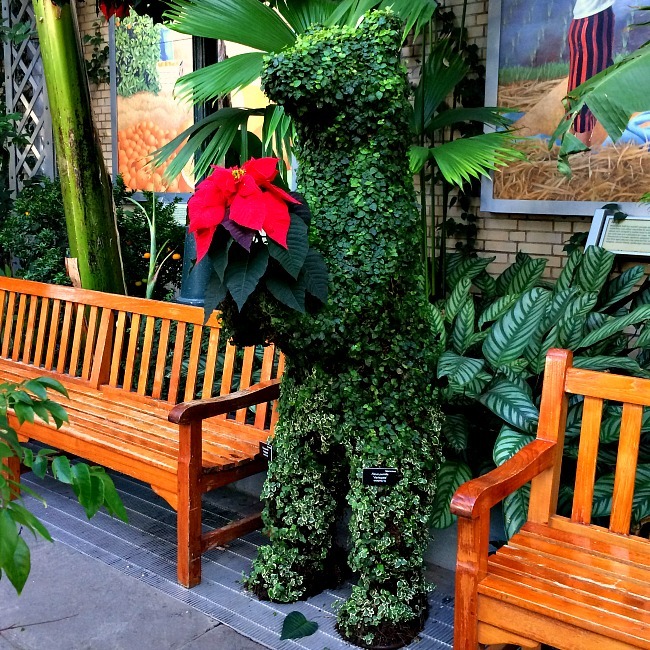 As if the U.S. Botanic Garden wasn’t whimsical enough, you can also get a nice photo op with a few teddy bear topiaries. 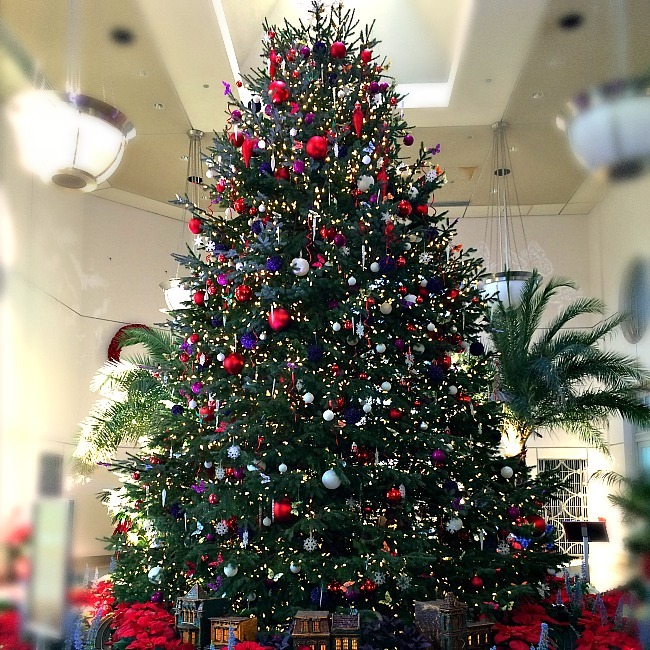 The Seasons Greenings exhibits run from Thanksgiving Day (November 24) through January 2nd and is free of charge. The Garden is open from 10AM-5PM except on select Thursday evenings when there is live music and the Garden is open until 8PM. There is no stroller parking. 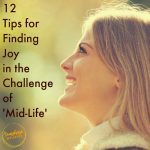 It is easy enough to navigate the Garden when it is not crowded. I imagine it could be less than desirable when there are large crowds. There are a few stairs to navigate, but nothing untenable. During the holiday season, there will be two entrances. The Conservatory Entrance and the Model Train Entrance. It is suggested to use the Model Train Entrance if you would to see the train display. The easiest way to reach the U.S. Botanic Garden is to walk (if you are already on the National Mall), or use public transportation. If you take the Metro, use the Orange, Blue, or Silver line and get off at the Federal Center SW station. The Garden is about 3 blocks north. If you head in the direction of the U.S. Capitol you will easily find the U.S. Botanic Garden, as it is situated within spitting distance of the Capitol. There are no restaurants inside the US Botanic Garden. the nearest restaurants are either at nearby Smithsonian Museums or near the Federal Center Metro station. Click here for the website for the U.S. Botanic Garden. I hope you have an absolutely magical holiday season with your family this year. 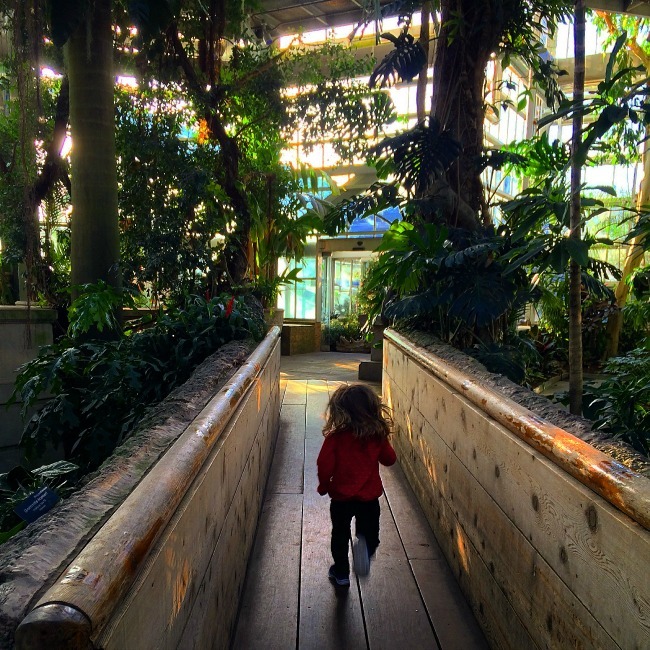 If you visit the U.S. Botanic Garden with your kids, I know at least those 2 hours will be absolutely delightful.